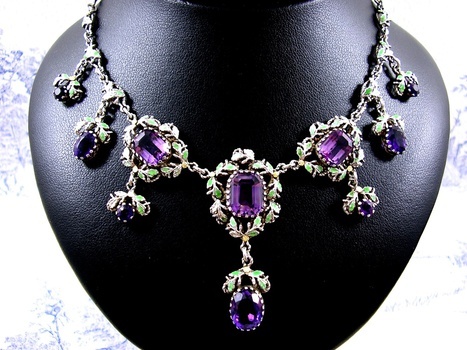 In Fine Jewelry > Victorian and Edwardian Jewelry > Show & Tell and Fine Jewelry > Arts and Crafts Jewelry > Show & Tell. A once in a lifetime piece of rare Arts and Crafts Jewelry by Kate Eadie wife of Pre-Raphaelite Painter Sidney Meteyard. Used as a model for many of his most famous paintings particularly that of St Cecilia it is possible to imagine what Kate looked like from viewing the paintings. Kate most likely learned under the Gaskins and was not a prolific artist subsequently her pieces are extremely rare. It is widely believed that members of the Suffragette movement were patrons of many Arts and Crafts jewellers. For example, the Scottish National Portrait Gallery has a portrait of a famous suffragette wearing an unidentified Arts and Crafts Pendant in Suffragette Colours. This intricate silver necklace features tiny sprigs of sparsely enamelled green oak leaves with tiny acorns surrounding Royal Purple natural Amethysts. The oak imagery being a tribute to the strength perhaps of the Suffragettes? Far more beautiful in real life the photo just gives a hint of the beauty of this necklace. NB. this was part of my past collection and is not for sale. Stunning! Where on earth did you find this jewel? Love the history as well. You probably had to pinch yourself. What a find! Fascinated to see this post as Kate Eadie was my Great Aunt!! Have a few of her paintings and enamels here that were passed onto me. Would love to know where you found that piece. Wow. That's an amazing story. I'm working with the Royal Birmingham Society of Artists at the moment on female prominent artists, and would love to talk to you more about your find. Can I email you? If you would like to know more about Kate Eadie, I may be able to help. I've left my contact number with Ainsley at the RBSA in Birmingham (0121 236 4353) or you can contact me on here!